Bentwood box resting in the Loo Taas canoe. 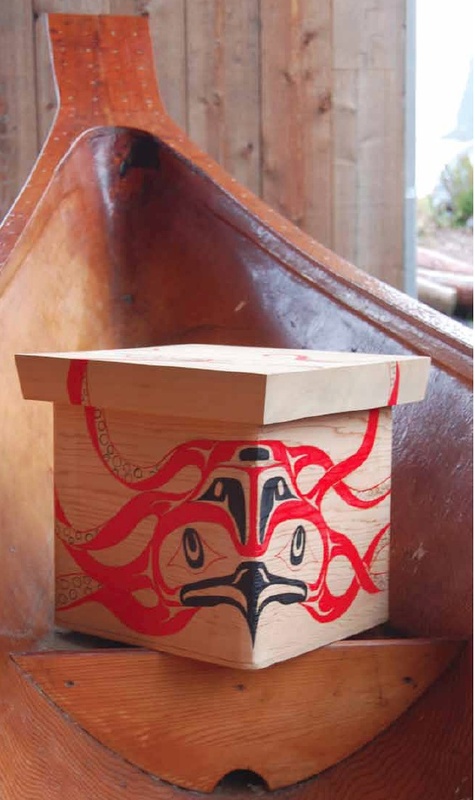 Design by Billy Yovanovich Jr.
Bentwood boxes were often used to carry materials during canoe trips. The boxes can be made in many different sizes and shapes and are made from one solid plank (i.e. : the plank is not cut into pieces). The plank is steamed so that the wood can bend to make a corner. Draw three different possible bentwood boxes that could each hold 24 litres of berries and label the dimensions of each box. What is the length of the wood plank used to make each of these boxes? Consider a 36 unit long plank. What different sized boxes (without lids) could you design using the entire length of this plank? Now consider the box that could hold the most berries possible. What would be the dimensions of the largest bentwood box that you could design from this plank? How do you know that this box is the largest of these designs? Please post student responses, your thoughts or reflections to the activity.